The terms military zone and death zone trace the colonial dynamics which have compartmentalised the city, in order to unpack further the claim that Kurdistan is a colony. A street in Diyarbakır. Author's photo collection. The situation of the Kurds in a drastically changing Middle East has received little attention in academia and less in the media despite their growing impact on regional and international politics. The biggest stateless people living in the Middle East are on the verge of a new status, not only in Iraqi Kurdistan, where a referendum for independence takes place on September 25, 2017, but also in Syria and Turkey. In Syria, Kurds have fought an organised and effective struggle against the IS. 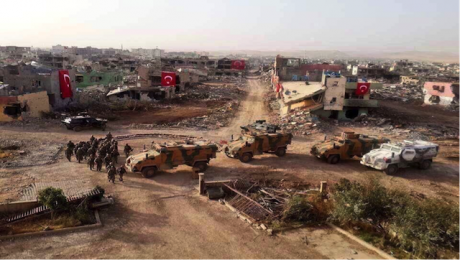 In Turkey, they have suffered a massive destruction of Kurdish cities, displacement of half a million Kurds and eradication of all forms of legal entity by the Turkish state. Then there is Iran. This week’s short series looks at current political struggles of the Kurds in four neighbouring countries. Mehmet Kurt, series editor. In the recent period starting in July 2015, with the sudden end in peace negotiations between the Turkish state and the Kurdish mainstream movement, we have witnessed an intensification of violence in Turkey Kurdistan. Kurdistan unlike the Occupied Palestinian territories does not exist on world maps. However, it does exist in the minds and hearts of its people. In this paper, I examine the new modalities of power emerging in neocolonial geographies more precisely, the spatial configurations of colonialism in Diyarbakır – de facto capital of Turkey Kurdistan. In doing so, I raise the question of whether this is an internal war getting worse day by day? If not, is it a colonial occupation, in the sense that the war is not in this country (in Turkey) but somewhere else (in its colony). 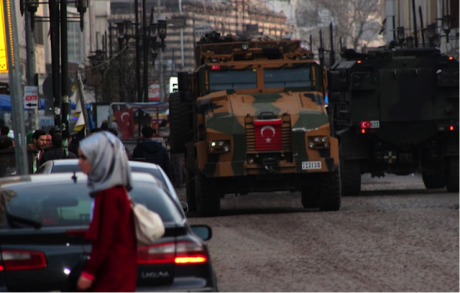 Can we approach the Turkish state`s current policies by deploying a neo-colonial narrative? The geographical layout of Diyarbakır very much reveals the range of forces that have shaped it. It is a city cut in two in a colonial manner, compartmentalized both in terms of space and its inhabitants. Almost half of the city is allocated to military quarters, compressing it from north and south. As a result, the new city expands in a horizontal direction from east to west. Researchers like myself, human right activists and journalists happen to pass by Diyarbakır from time to time. Other than these groups of people, Kurds living in other cities and people who have an economic interest in the city, mostly hired by the government, I haven't encountered anyone else who has mentioned living in, or visiting the city. People who are not local inhabitants of the city are either scared or do not find the need to breathe the same air with locals. They go out from their spatial accommodation and communities as little as possible. They simply do not interact. Instead, they keep a distance which, I would argue, is in itself singularly colonial. Fanon calls them “the governing race”, those settlers who are always foreigners who come from elsewhere. In the case of Diyarbakir, settlers do not come from overseas but from the western part of Turkey. They remain foreign. Bureaucrats, teachers, entrepreneurs, religious officials are likely to have an economic interest in being there. They are strangers in the city in the sense that first, they don’t interact with the local community, and have no interest in participating in its social life, but mostly wait it out until their compulsory service period is over. Secondly, they are considered as strangers/representatives of the Turkish state by the locals, and therefore get easily identified and marked in public space. And not so surprisingly, they claim a right on the land and administration as a part of the homeland. They represent the state – people of Diyarbakır always add Turkish when they use the word state – whose rule is imposed and can only be maintained by means of force; guns and war machines. In Cizre, a district of Sirnak almost completely destroyed during the curfews, 1300 teachers who are originally from the west were texted and called back by the Ministry of National Education, just before the armed conflict started. Graffiti from those who imagine Kurdistan will end up in a graveyard.Indeed, the graffiti above, also from Cizre, gives an insight into the anxiety gathered around the fact that people living in the Kurdish regions are like natives of some place that is not Turkey. Other than public officials, the direct representatives of the state appear to be the police and army. Police barricades and stations on every corner, the armoured vehicles passing every five minutes, checkpoints always present in the street of Diyarbakır – these constitute the dominant symbols of social order. An informant suggested that, “if you move the flags and the army out of Diyarbakır, there is no State here”. All the police cars and tanks carry Turkish flags and, at least once a day play a very nationalistic song “Ölürüm Türkiyem” (I Would Die for My Turkey). As a snapshot of the year of 2016, the armed conflict between the Turkish state and PKK moved into the city centres and, self-governance was declared in several districts. By that time the governmental strategy of declaring on and off curfews enabled the Turkish state to cut off all outside connections and access to basic needs such as food, electricity, water etc. from these districts. People who lived there were forced to leave: the ones who couldn`t leave or refused to do so were criminalized as terrorists and killed. Within this period, I argue that the city divided into two – a military zone and a death zone. The former includes the barracks, boardings for the families of soldiers, teachers and bureaucrats, the office of the governor, which are usually built next to or close by each other, very well-protected with high technology. All the public housing allocated for government officials are surrounded by walls and signboards stating that the area belongs to the military and that entrance is not allowed. The immediate presence of the police and military proves that no one needs to hide their oppression. On the contrary, the ordinary language of life is pure violence, the violence of the settler. Many checkpoints and portable police stations have been built there, as the figure shows, which can either target or be the target itself. The death zone – contrary to the military zone as a territory of prosperity, wealth and security – is defined and marked by the power to kill and of death as a result. It can be a bomb attack; you can get hit by an armoured vehicle or just by a bouncing bullet. 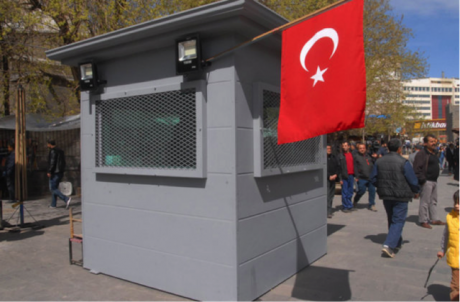 Portable police stations everywhere in the city.After all, state violence has always been present in the streets of Diyarbakır and in the lives of its inhabitants. In the recent period starting with summer 2015, however, we witness an intensification of violence in a “war without an end” form. We have faced the re-territorialization of physical space through turning many districts into death zones; and the re-occupation of lives by constant police harassment, fear of death and humiliation. Meanwhile, the Sur district of Diyarbakır has become a fabric producing and circulating this toxic knowledge of death. In the Sur district, the most historic part of the city, known as the heart of the city, armed conflict raged for almost four months. During that period, the police and soldiers stayed in the local houses and hotels and left their marks in the streets. When the curfew was partially lifted, the racist and hateful language of the state once again became visible. Previously, mentioning the mundane symbols of social order in Diyarbakır, I argued that they reflected the neocolonial legacy of the Turkish state seeking ways to make its sovereignty visible and tangible. This exhibitionist attitude operates not only at the symbolic level of social life but also involves the struggle over the organization of the space. With the sudden end in the peace negotiations the war moved to a new phase. The notion of hendek, ditches was introduced into the political discourse and became a symbol of resistance on the Kurdish side. Ditches, beyond the holes in the land, represented the collective will of insurgency. At this point, the graffitis carved on the walls give us important clues to the state`s response; how space is imagined and twisted in Kurdistan. “If you are Turk be proud, if not obey” or, as the figure says “JOH (special police soldier forces) came to Sur to educate. The subject is obedience”. 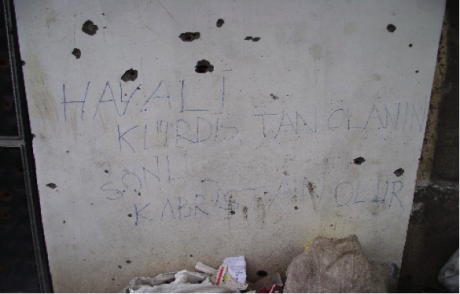 Police soldiers left their mark in Sur.These writings can be seen as outpourings of the colonial heritage of the Turkish state. In the self-governing neighbourhoods, the state met the autonomy of the ditches with destruction and humiliation. 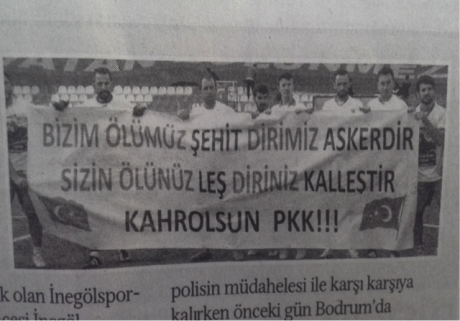 Outpouring of racism in the Turkish Cup.War, after all, implies a struggle between a minimum of two parties. Yet, the term itself does not tell us much about the reasons/nature of the “conflict”. Therefore, I purposefully name it occupation, not to treat war through the lenses of security and counterinsurgency but as a matter of the takeover of land and resources and assimilation. Racism, “essential to the social construction of an otherwise illegitimate and privileged access to property and power” as Stoler said, has long been the founding relation uniting the colonizer and colonized. In this context, I treat racism as a central organizing principle of Turkishness, of differentiating between ruler and the ruled as was the case in so many other colonial contexts. The ongoing war in Turkey Kurdistan can also be referred as “İsraellilesme” (becoming Israeli likewise), embracing the Turkish state`s politics of collective punishment of Kurds. At this point, I would turn to the term ‘re-occupation’ to understand the new phase of the war in Turkey Kurdistan. Violence has always been present and foundational in colonial geographies so – why now? The Arabic word fetih means to conquer a city or a country by war. Especially in the Ottoman political imaginary, it was often used to refer to the politics of conquest. In the current discourse of AKP, it is possible to find references to the same vocabulary, trying to recall the soul of fetih. “The fetih of Istanbul”, for instance, is celebrated every year with million-dollar-budgeted organizations. In 2016, the whole city was covered with pankarts of “joy of fetih” synchronically matched to the ongoing war in the Kurdish regions, which escalated to the point of destroying entire towns within a matter of days. The figure shows the level of destruction and “the soul of fetih”, soldiers hanging flags everywhere and playing Mehter Marşi which is originally the Ottoman military marching song. Nusaybin June, 2016.The discourse of fetih as a site of production makes reference to a particular time in history, the Ottoman Empire. The justification for the bloody war taking place in the Kurdish regions in the eyes of Turks is produced by recapturing the nostalgia of the good, old, powerful days of the Turkish nation. No need to mention that it accumulates other familiar, therefore, dangerous discourses of nationhood and Islamhood, and by doing so, gets stronger. At the end of the day, to be a Turk requires that one celebrate the soul of fetih for the sake of the nation, so much so that different occupational groups sent Turkish flags and a Koran to the military forces “fighting against terror” in the district of Sur. This is neither Cizre nor Sirnak (referring to the districts in the Kurdish regions under curfew by this time). This is the Republican city of Artvin. I hope that not even a single person's nose would bleed in Artvin. If the people of Artvin get hurt, I am telling you, they cannot pay the price for it. They are just mixing Artvin with other cities. He gave this speech at a protest in Artvin, trying to prevent police intervention against the protestors. Claiming Artvin in this republican manner, as an indicator of the city`s distinctiveness from the Kurdish regions, indeed reveals the founding principle of the Turkish state. It is a very symbolic declaration of the simple fact that the colony is distinct from the metropole, whereby the latter is seen as a collateral of the state of emergency and the state of siege. 79 günlük sokağa çıkma yasağı Cizre gözlem raporu (Rep.). (2016). Arslan, S., & Sandal, H. (2015, November 21). Farqin`de devletin 'duvar yazisi' halleri [Web log post]. CHP milletvekili Uğur Bayraktutan: "Burası ne Cizre, ne de Şırnak, burası bir cumhuriyet kenti Artvin" (2016, February 16). Turnusol.biz. Cörüt, İ. (2015, December 16). Türk Devleti’nin kolektif cezalandırma siyaseti ve hendekler. Bianet. Ekin Van olayına dair inceleme raporu (Rep.). (2015, September 4). Fanon, F. (2001). The wretched of the earth. London: Penguin. Mbembe, A. (2003). Necropolitics. Public Culture, 15(1), 11-40. Stoler, A. L. (1989). Rethinking Colonial Categories: European Communities and the Boundaries of Rule. Comparative Studies in Society and History, 31(01). Terörle mücadele eden polislere kur'an-ı kerim ve türk bayrağı. (2016, January 30). I use the term death zone to refer to a territory where no one has security of life protected by law/citizenship- in order to underly this peculiar terror formation that keeps ramifying in the neocolonial geographies. Death zone refers to geography of lawlessness where the tortured bodies can be tied to the back of a police car and displayed in public. According to the report of Human Rights Foundation of Turkey, between the dates August 16, 2015 and April 20, 2016 there had been 65 officially confirmed, open-ended and round-the-clock [all day long] curfews in at least 22 districts of 7 cities in Southeastern Turkey. At least 1 million 642 thousand residents affected by these curfews and according to the statement of Ministry of Health on February 27, 2016, at least 355 thousand residents were forced to leave the cities and districts they lived in and at least 338 people lost their lives.